This week, all the children have been practising hard for their Christmas performances, from our very youngest Foal of six months to our Year 6 children. Like you, I am excitedly anticipating to the five events taking place over the next two weeks and I look forward to seeing you there. Christmas has arrived early this afternoon in Reception and will appear subsequently in the other classes over the next week. The children and I are thoroughly enjoying the build-up to the Christmas season. 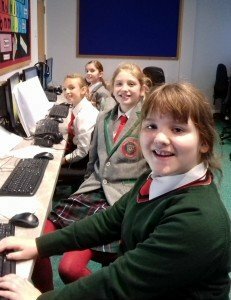 Our children from Years 3-6 are looking forward their annual Carol Concert in aid of Racing Welfare at Tattersalls on Wednesday 12th December. Please click here to buy your tickets for this memorable evening. 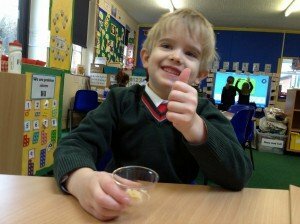 This week in Reception, the children have had even more fun exploring their senses. 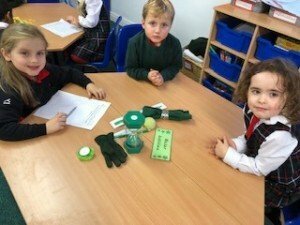 In English, the children have enjoyed smelling and feeling a range of different objects and have written simple sentences to describe their findings. They have also made peppermint and lemon creams and thoroughly enjoyed tasting them! 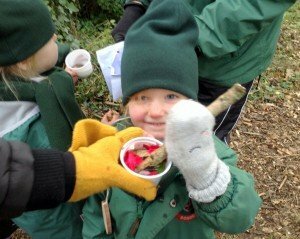 In the forest, the children created some fantastic fragrant potions with super powers! These included; fairy perfume, an adult sleeping potion, and a potion to make you dance like a fairy! 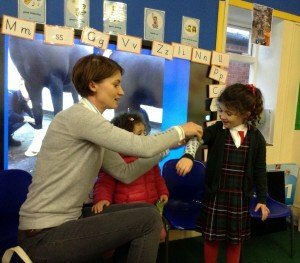 The class were very excited to be visited by Lola’s Mummy, who told everyone about her role as an Equestrian Vet. The children had lots of fun exploring the stethoscopes and practising their bandaging skills. I think we may have some super vets in the making! Thank you so much for all the amazing costumes provided for this year’s Nativity. We very much look forward to seeing you on Thursday 6th December at 9.15am in the Performing Arts Centre. 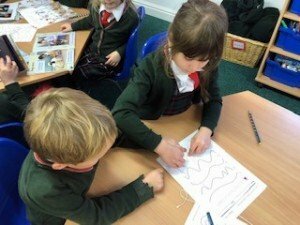 Year 1 have been very busy with a lot of Maths. In their ‘Maths Day’, they set up different tables with activities on all that they have covered in Maths this term. 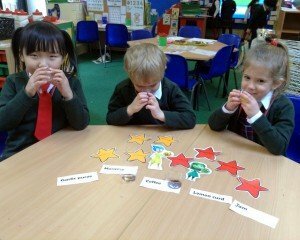 They went around the room applying all their learning from this term (Mrs Scott made this very tricky!). Year 2 were so disappointed to hear that the Christmas lights for their classroom weren’t working! 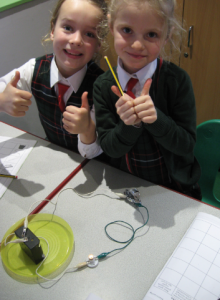 Miss Drayton confessed that she wasn’t very confident with electrics so asked for the children’s help. 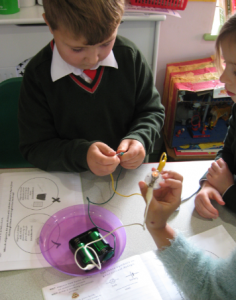 She challenged them to make a working electrical circuit using two wires, a bulb and two batteries. 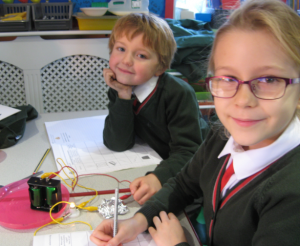 The children had great fun experimenting with the equipment and eventually found that the circuits needed to be complete to allow the electricity to flow through them and light the bulb up. 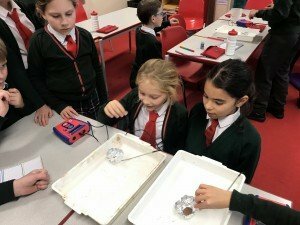 They then investigated which materials are conductors and which are insulators, by adding different objects such as a spoon and a jumper, to see if they allowed electricity to flow through them or not. They had so much fun and learned a lot! 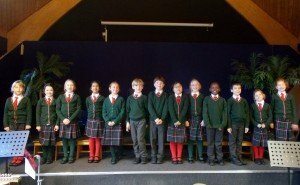 Year 3 thoroughly enjoyed sharing their Michaelmas term learning with the rest of the school in their Assembly. 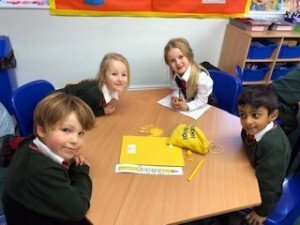 Year 3 reflected on this term’s topic and chose and wrote their own contributions. They then staged the Assembly for dramatic effect and opened wearing their Mayan Event masks! Everyone spoke clearly, enthusiastically and engagingly about The Mayans, modern day Mexico and our visit to the Museum of Archaeology and Anthropology. Well done, Year 3. 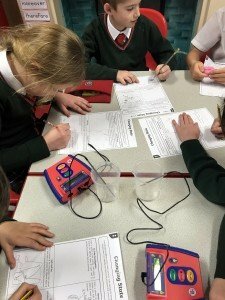 In Science, Year 4 are learning about states of matter and the processes that change the states. 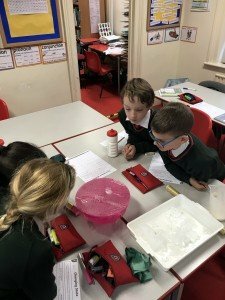 They investigated water as a solid, liquid and gas. They also melted chocolate and observed the reversible change as it cooled. This was a most enjoyable experiment, as the left over chocolate had to be eaten! 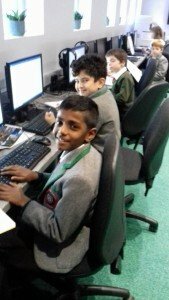 Year 5 has continued to work very hard this week. 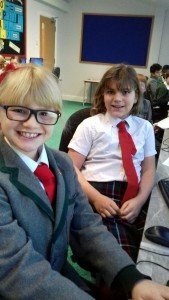 In English, we have been developing our descriptive writing skills by using figurative language including similes, metaphors and personification. 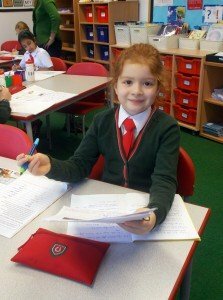 The children have been busily writing a descriptive piece on a setting of their choice. They will subsequently edit their work, questioning where improvements could be made. 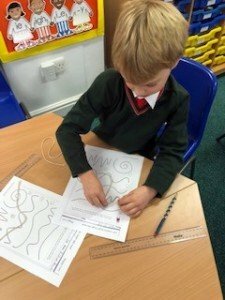 In Maths, we have been learning about measuring and drawing angles accurately. The children have enjoyed the practical element to the topic and have been using their protractors with confidence! 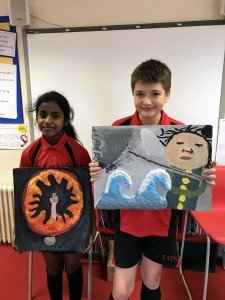 In Art this term, Year 6 have produced abstract mixed media works of art, influenced by the characteristics of women who have changed our lives, such as strength, resilience and perseverance. 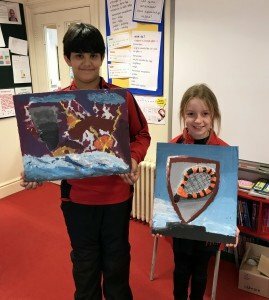 They have created some wonderfully unique pieces. 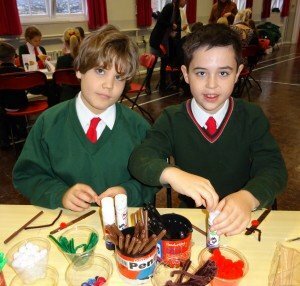 Years 5 and 6 enjoyed a festive morning of Christmas Crafts this week at Thetford Grammar School. 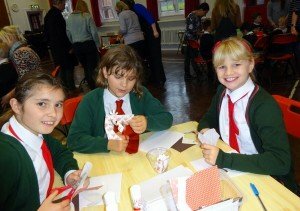 The children had great fun making Christmas cards, Christmas decorations and icing biscuits. 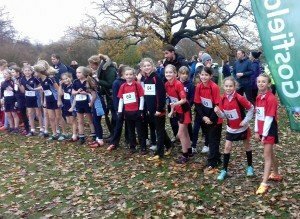 “On Wednesday 28th November, the U11 A Team played Old Buckenham Hall (OBH). We started with the ball and they quickly got stuck in. There was some great defending by Cecilia pushing the ball back up the pitch. Lara made some superb interceptions but, unfortunately, OBH managed to score a goal. OBH’s defence was amazing and, despite our best efforts, we didn’t manage to get the ball through. In the second half, after a quick team talk, we were ready once again. We thought they were going to score but Zara made an exceptional save, which delighted the whole team! In the final minute, we were awarded a long corner. Ava took the ball and scooped it over the defender onto Ella’s hockey stick and Ella scored! The end score was 1-1. Abisha was Player of the Match due to her fantastic hits. Even the OBH coaches commented on them! We were really proud of the result, as OBH played hard. Well done, team, for a really good effort! 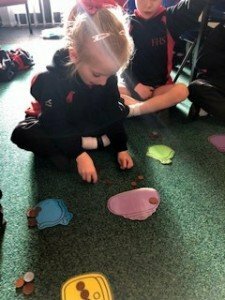 “On Wednesday 28th November, the U11 Girls B Team played hockey against Old Buckenham Hall School. We won the toss and decided to have the first push back. Evie and Fleur did some great tackles and passes. We soon scored. At the end of the first half, the score was 1-0 to us. Molly made lots of excellent saves and Darcey did some fantasic passes up the sides. Isabella made some great tackles and Evie sored our second goal! Then I scored my second goal. We need to work on finding spaces and using the sides. The final score was 3-0 to us and Evie was Player of the Match. Well done, team – keep up the good work! The final Informal Tea-time Concert of this term took place on Tuesday and, once again, proved to be a delightful and enjoyable occasion. As ever, your assistance with the children’s daily practise is greatly appreciated and clearly makes a huge difference. Well done to all the children who have performed this term. 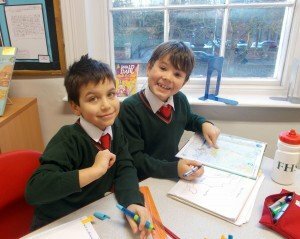 Next week is the last week of After-school Clubs, apart from Prep Club and After-school Care, which finish on Thursday 13th December. Parents of children who are in the Dance Club are invited to watch their children in action in the Old Hall on Thursday at 4.45pm. Those children who are swimming this half term will have their final lesson on Thursday. Parents are invited to watch this lesson whilst their child is in the water. Years 3-4 swim from 2.00pm to 2.30pm and Years 1-2 are 2.30pm to 3.00pm. We have a large number of unnamed items of uniform, including coats, blazers, new PE kit and a plethora of socks, tights, etc. Please ensure that all items of clothing are securely and fully named. As you can imagine, there is no way that we can return these items to their rightful owners. We are missing a significant number of ‘reading books’, particularly in the older years. If you find any at home, we would be most appreciative if you could return them. Thank you. 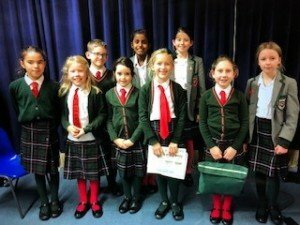 Monday: Years 3 and 4 are excited to be taking part in a new event in our calendar when they will be singing to the residents of Soham Lodge Residential Home. 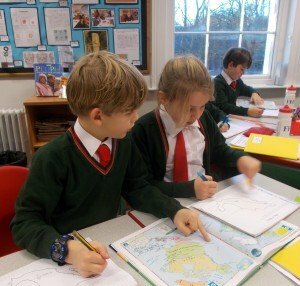 Tuesday: Year 5 will visiting Duxford Imperial War Musuem. They will be taking packed lunches and will be back by the end of the school day. This should be a wonderful finale to their topic on children in World War II. Wednesday: Please do come and join me in the Performing Arts Centre for a festive drink and mince pie at 3.00pm for the final Head’s at Home of this term. This is your opportunity to chat informally with me about any aspect of school life. Thursday: The Reception children are eagerly practising their Nativity and this year’s production of the ‘Grumpy Sheep’ looks to be an extra special one! The doors will open at 8.45am and refreshments will be served. Please may we respectfully ask that you park off site. Thank you. Friday: All the Nursery children are coming together to perform their Christmas celebration at 3.00pm. 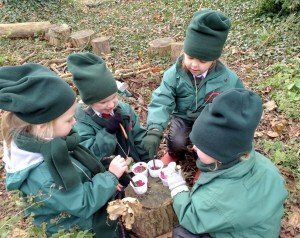 All Nursery parents have received information about this and a request slip for a maximum of two tickets. Doors will open at 2.30pm and parking will not be available on site. Thank you in advance. This week, Kindness Cups were won by Lottie in Year 2 and Finlay in Year 4. Well done, children. This week, we wish a happy birthday to Eva and Woody in the Nursery, Aria in Reception and Annabelle in Year 1.